There are two forms of dietary iron, heme and nonheme. Heme iron is bound to hemoglobin and myoglobin. This type of iron is found in animal products and is the most efficiently absorbed form. Nonheme iron is found in plant foods and is poorly absorbed compared to heme iron. Liver is the best food source of heme iron. Kelp and brewer's yeast are good plant sources of nonheme iron. Ferrous bisglycinate chelate is the most efficient form of supplemental heme iron. The absorption rate of nonheme iron supplements such as ferrous sulfate and ferrous fumarate are around 1-3%. Despite the superior form of heme iron in bisglycinate chelate, nonheme iron is the most popular. Even taking the best quality nonheme iron the net absorption is 50 milligrams compared to only 3 milligrams of heme iron. It takes that much more nonheme iron to equal a smaller dosage of heme iron, and the heme iron absorbs better. Iron deficiency is the most common nutrient deficiency in the United States. The target groups at risk are infants two and under, teenage girls, pregnant women, and the elderly. 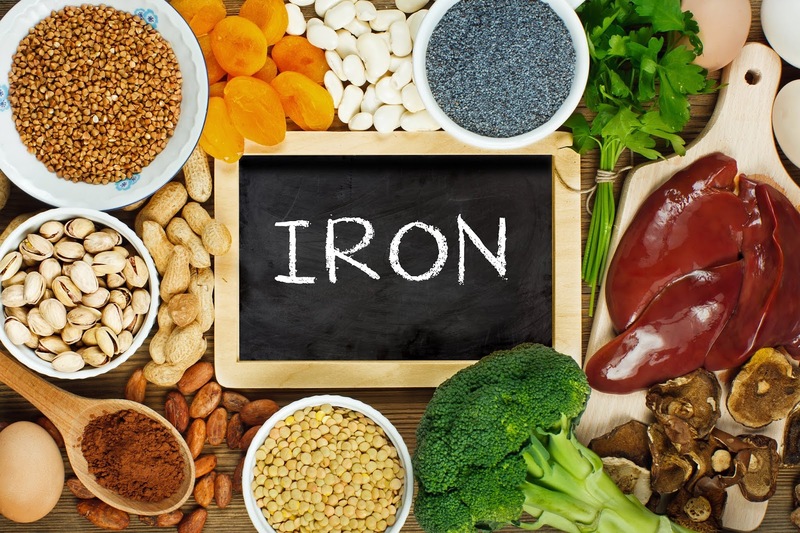 Iron deficiency may be caused by an increased iron requirement, decreased iron intake, diminished iron absorption, blood loss, or a combination of such factors. Vegetarians and vegans also run a higher risk of iron deficiency. Adolescents and college age students run a high risk of iron deficiency due to poor diets. Other causes of decreased iron absorption include chronic diarrhea, malabsorption, and the use of antacids. The effects of iron deficiency are caused by the impaired delivery of oxygen to the tissues and the impaired activity of iron-containing enzymes in various tissues. Iron deficiency can lead to anemia, excessive menstrual loss, learning disabilities, impaired immune function, and decreased energy levels. Serum ferritin is the best laboratory test for determining iron deficiency. Routine blood analysis is not accurate enough. Men may suspect iron deficiency if they have a history of peptic ulcers, hemorrhoids, blood loss, or long-term use of antacids. Iron plays an essential role in the hemoglobin molecule of our red blood cells. It functions in transporting oxygen from the lungs to the body's tissues and then transports carbon dioxide from the tissues to the lungs. Iron also functions in several key enzymes in energy production and metabolism, including DNA synthesis.